Karbonn A27+ an another Dual core Budget smartphone from Karbonn launched at RS 8999 . Well the specs of the phone are basically same that you find on budget Dual core smartphone under RS 10000 . 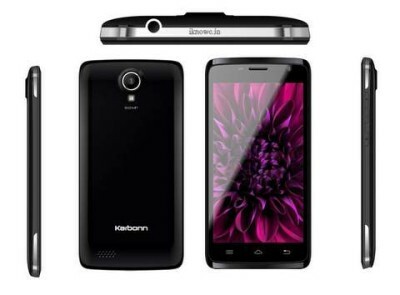 The company had also recently launched Karbonn A50 a single core device with 2G support . It seems that Karbonn wants to launch all its budget smartphones before people starts ignoring them .As we know that peoples are waiting for 1.5GHZ quad core smartphone and it seems that 1.2GHZ quad core processor had gone old now . Gionee Elife E5 , iberry Auxus Nuclear N1 & Xolo Play are the devices with 1.5GHZ quad core smartphone paired with 1GB of ram . Although Xolo Play T1000 is integrated on Nvidia Tegra 3 CPU . The A27+ will compete with Gionee Gpad G1 ( unboxing & review ) , Micromax A110 canvas 2 ( review ) , Celkon A119 HD & Xolo B700 . It is powered by 1GHZ dual core processor integrated with 512MB RAM . The handset has access to Dual SIM card slots . Android 4.1.2 is there to make the device alive . It has 5inch capacitive display of qHD resolution ( 960×540) to delight the user eyes . The device has 8MP auto focus camera with LED FLASH & of course there is front facing camera ( may be VGA ) . It has 2000mAH battery to make the hardware of the device run . The battery of the device claims the talk time of up to 7hrs (2G) and 400hrs of standby time . The Smart A27+ has 4GB on board storage ( 2.5GB available for the user ) . The expandable memory is upto 32GB . It has 0.517 W/Kg SAR value . For providing better user experience & for the hardware enhancement of A27 , it packs with proximity sensor , G-sensor & light sensor . Features like 3G , 2G , WIFI , Bluetooth , GPS , 3.5mm audio jack and micro USB connectivity comes pre equipped . Overall Karbonn A27+ Smart is a good device at this price ( specially 2.5GB user available memory ) . You can buy Karbonn A27+ via flipkart at price of RS 8999 .